Was in here Saturday past. Quality Pint of Guinness,and they sold a decent pint of Snake bite and black, so pleased my drinking companion.She also liked the pub because it was nice and warm. Good friendly effecient barstaff.A good miix of locals and passing through clientelle.And decent surroundings. Pleasant enough. Popped in to meet friends. Well mannered Irish barman (landlord?) poured me a decent pint of ale. Overall seemed reasonably relaxed compared to other drinking holes in the area. 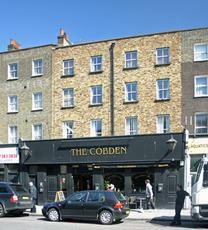 This is a smallish pub near the bottom end of Camden High Street with a slightly, but not overtly, Irish feel to it. I paid two visits recently - the first on a Sunday when my companion and I had an excellent roast beef and Yorkshire pudding, which was generously portioned at �8.50. The two large glasses of wine were a bit on the steep side - �4.30 a glass. On a second visit I sampled an ale called Hare Raiser from Green King which was a bit close in taste to their IPA and not really to my liking. However, I note that the pub is now serving a rotating guest ale and espy some Brewdog beers coming up in the next three months so a return visit is on the cards. This is a great little pub with friendly staff and simple pub food. It is easy to get comfortable and the 2 plasma screens are a real bonus. Pride was the only real ale on along with Guinness, Guinness Extra Cold and the usual suspect lagers. The music is not to imposing and the locals seemed friendly enough. There are 3 very small tables outside on the high street for the smokers, but they are not very comfortable with people constantly walking past. The next time I�m in Camden I will make an effort to visit here again. This pub was my local for 10 years. I could've chosen myriad pubs in Camden as my local but this one felt the most special. Lovely Thai food, relaxed atmosphere, friendly staff and a georgeous drop of Guinness. Working in the music industry (as one does) it was great to get away from the usual crowds and enjoy a relaxing evening eating, drinking and enjoying excellent conversation. Even my Irish companion said it was like a home from home. A real gem.